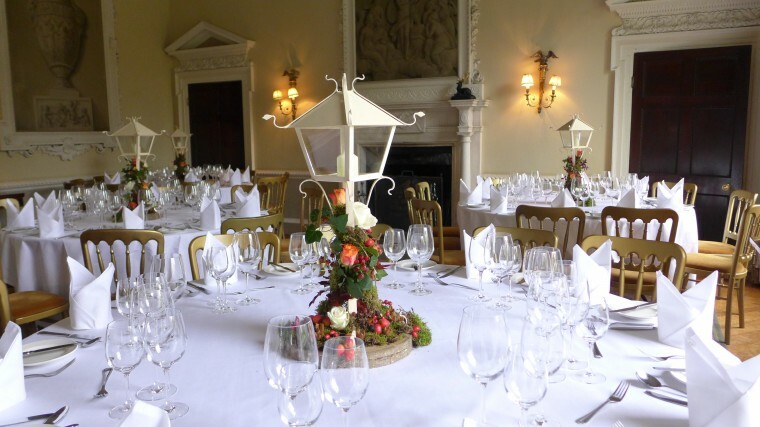 You are here: Home > Autumn wedding at Ston Easton Park. 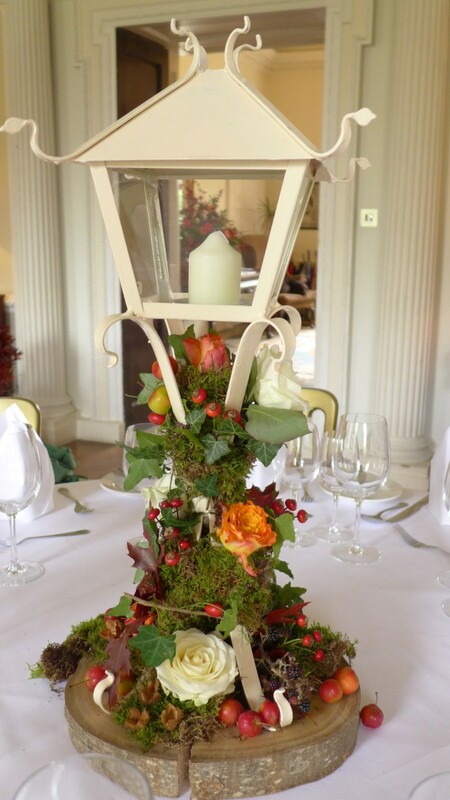 Autumn wedding at Ston Easton Park. Posted by Lorely on October 14, 2014. 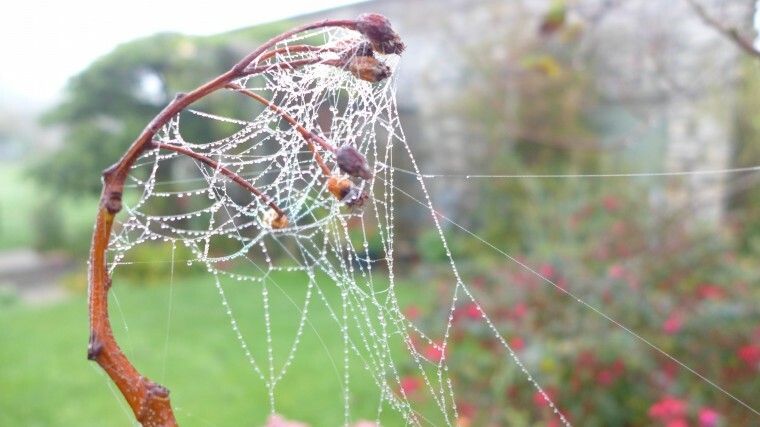 A misty Autumn morning and an early start to take flowers to the lovely All saint’s Church of Publow village for Zoe and Neil’s wedding. Then onto the country house hotel of Ston Easton Park. As we drove down the sweeping driveway lined with Autumn trees there was promise of a lovely day for an October wedding. 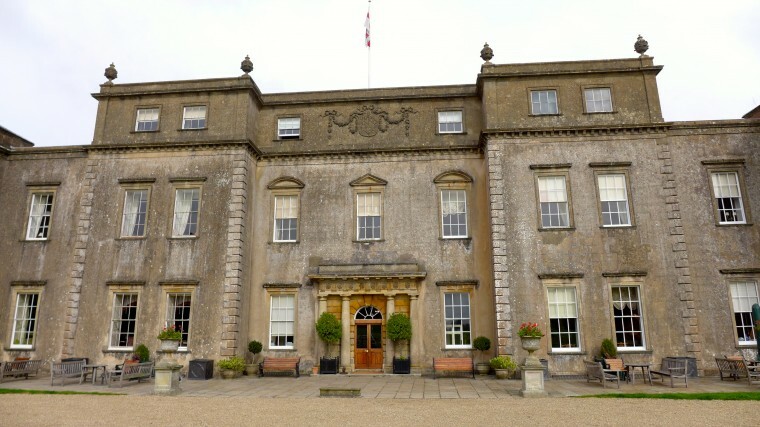 Ston Easton Park is a beautiful country house set in 36 acres of parkland just 11 miles from Bath. As you walk through the front doors it is like stepping back in time, to an era of decadence and romance, perfect for a wedding venue, with original antique furniture, glistening chandeliers and beautiful fabrics it couldn’t be more inviting. Especially with roaring open fires and the resident dog Oscar curled up in an armchair. 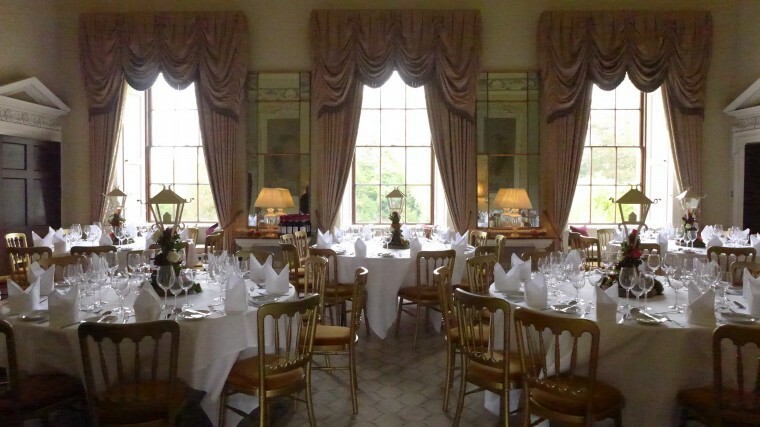 The country house hotel, Ston Easton Park. Zoe had chosen really rich autumnal colours with a touch of ivory, her wedding bouquet was a lovely combination of mango calla lilies, burnt orange mariyo roses and avalanche roses, with a hint of autumn hedgerows coming from the rose hips, hypericum berries and andromeda. Her four bridesmaids carried smaller posies in the same flowers. Sometimes as the florist when you have really enjoyed making the bouquets you wish you could see the bride and her bridesmaids with their flowers! 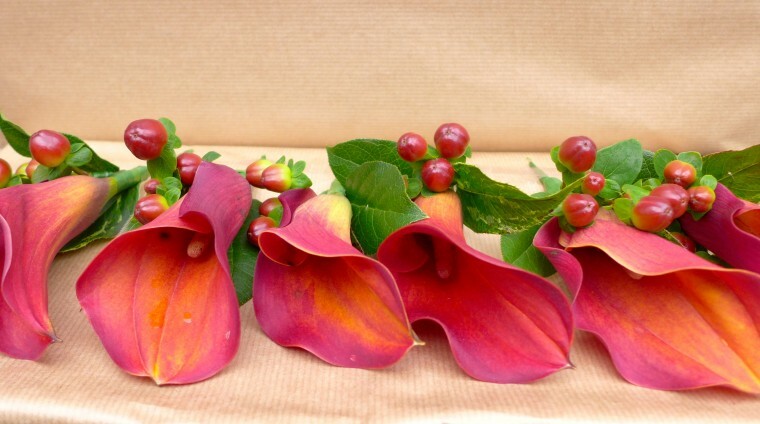 The buttonholes were perfect for an autumn wedding, mango calla lilies with dark brown hypericum, simple but really striking. 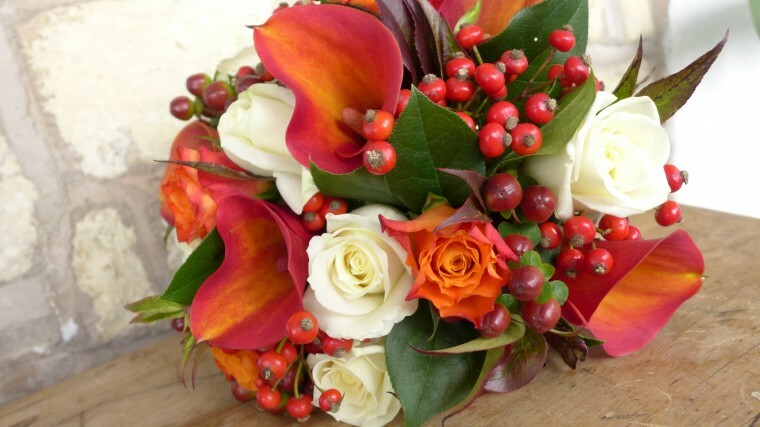 Zoe’s bouquet, of callas, roses, rose hips and berries. Now for my favourite part of this wedding, ever since I first discussed wedding flowers with Zoe I was looking forward to doing their table centres, I knew they would look really different and be perfect for the venue and the time of year. Zoe and Neil had beautiful lanterns made for them and they wanted them decorated with roses, as it is such a country venue I knew it would look lovely if we incorporated crab apples, blackberries, rose hips and moss to give them a country hedgerow feel. They sat on rustic wooden bases with the table names marked on the wood. Detail of the hedgerow lanterns! With the golden warm colours and decadent look of the dinning room they worked perfectly and I really enjoyed making them! The nights are drawing in and candlelit tables are perfect for a October wedding. Autumn is a great time of year for a wedding and it is really lovely when you get to make something so seasonal. Congratulations to Zoe and Neil and hope they had a very special day in such a lovely setting. The dining Room. Ston Easton Park. 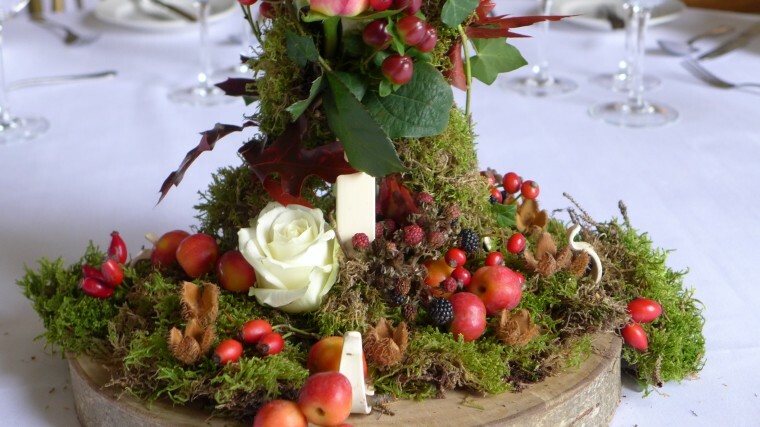 Roses nestled in moss with berries, rose hips and crab apples.